Ok, finally managed to get some pix. 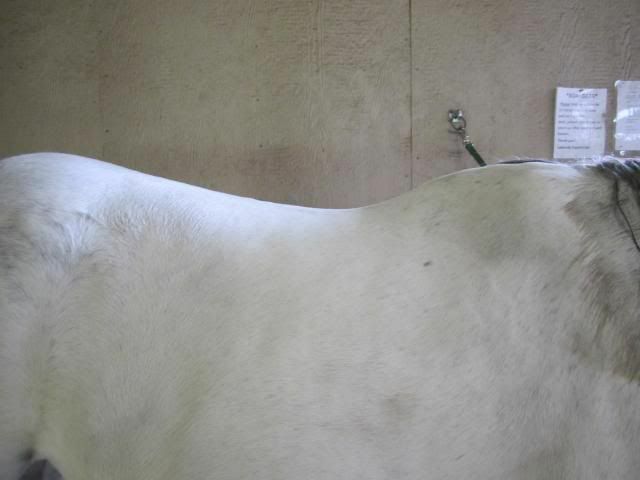 First, a couple of pictures of Pepper's back in general. She's totally relaxed here and a little slouchy because she was dozing off while I groomed her. Don't know if you can see that it's absolutely POURING rain outside. Fortunately she was blanketed so only her neck was wet. This last picture I was trying to show how the saddle is shaped -- the padding thickens just a little back from the front edge (probably where the bars are) so that the front edge gaps out a little from her shoulder. This is probably a good thing, I think, since probably allows a little free-er shoulderblade movement. The saddle looks to me like it is still an excellent fit. The dry spots, though, where there formerly weren't any, are a mystery. 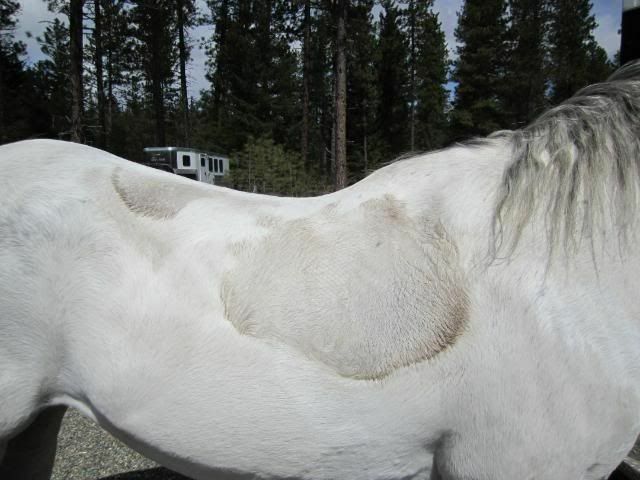 But don't dry spots usually result from a saddle being too small & tight, rather than too big? I'd think working under collection would build muscle & actually make her somewhat larger & more developed. 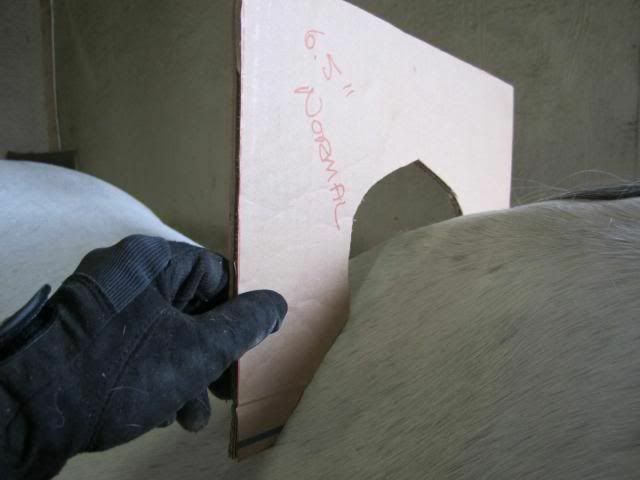 My take with saddle fitting is to fit the largest area and make adjustments to the other. I would try to borrow a FQHB and see how it actually fits. 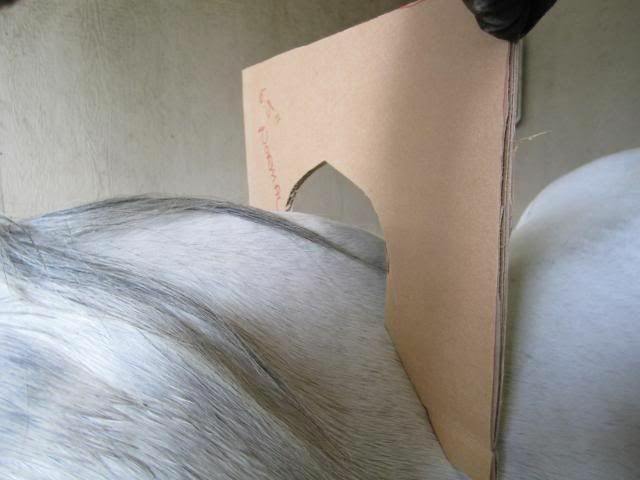 Something I do, is to make templates of the horses back. Use a piece of house electric wire (it bends easily) and make templates of her back every 3 - 4". Cut them out of cardboard. 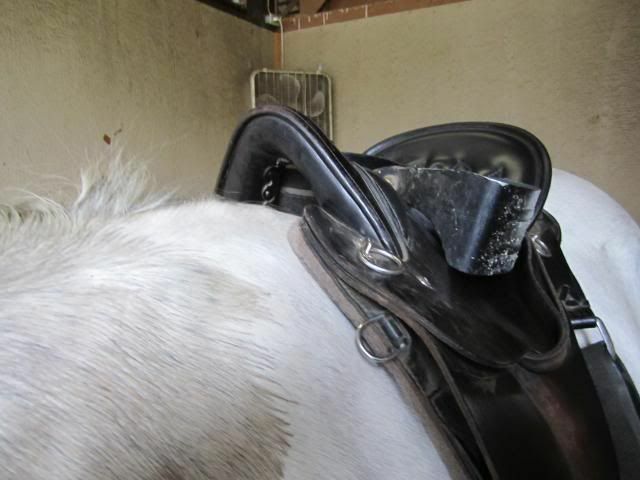 Flip the saddle upside down and sit them in. You get a great visual this way. Don't forget to make one the length of her back to check the rock. Excellent idea, Mrs. Hook. I'll see what I can do about making something like that. 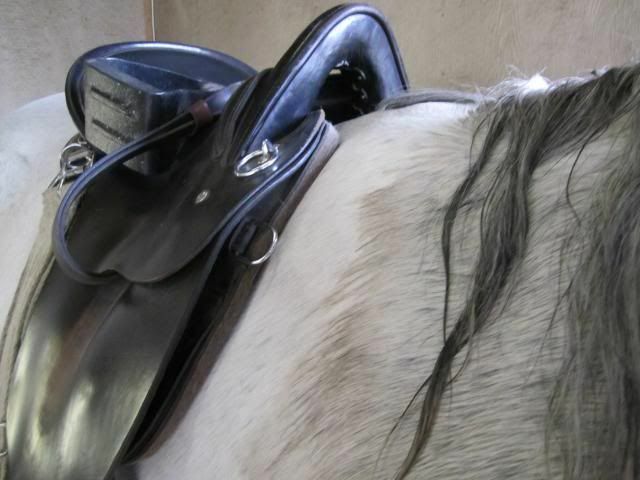 BTW, the saddle in the picture is a Tucker wide tree plantation saddle. Their wide might not be quite as wide as some other manufacturers if I remember what Chuck told me correctly. 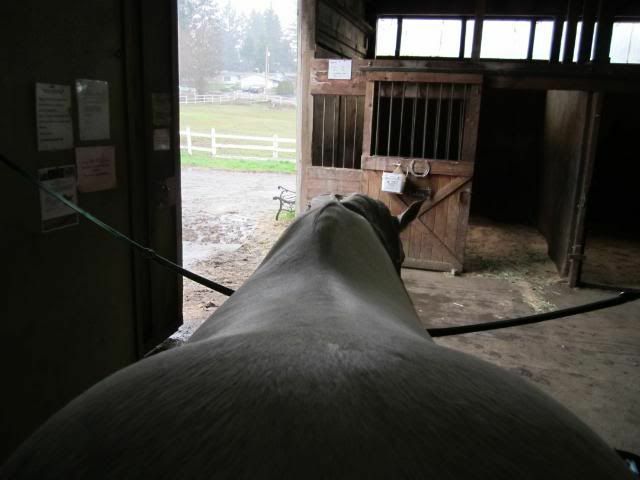 I'll see if anyone else in the barn has a FQHB saddle they'd be willing to let me try. MY problem with Hookie's fit may be similar to yours. 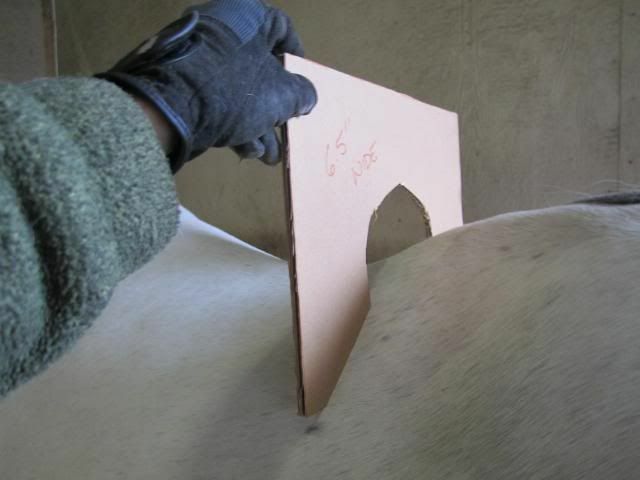 He needed a flatter saddle to fit across his back and a narrower withers. 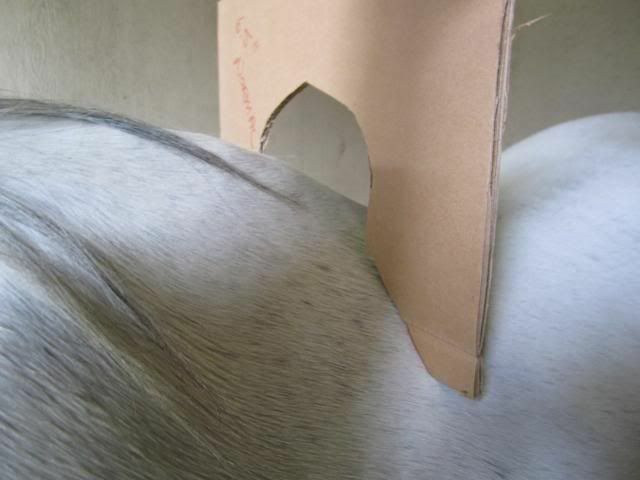 My solution was a saddle with FQHB to fit his back and an extra thick felt pad to fill up the the space at his withers. I think when you use the extra templates Fern suggested you will be able to get closer to a solution. 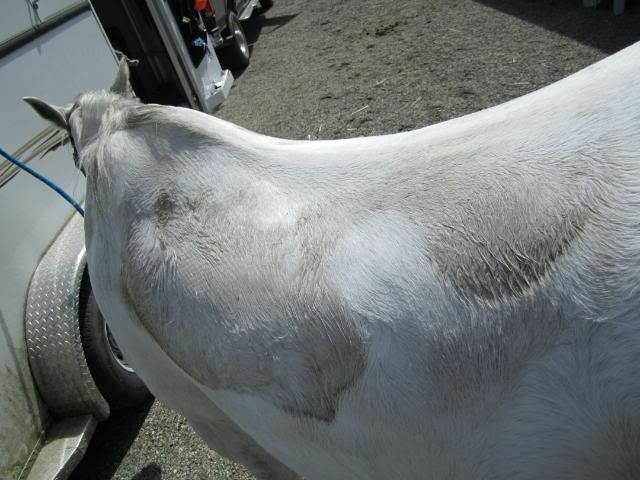 Hmmmm, so what does THIS sweat pattern tell you? The spots I was concerned about aren't there anymore, but... ???? 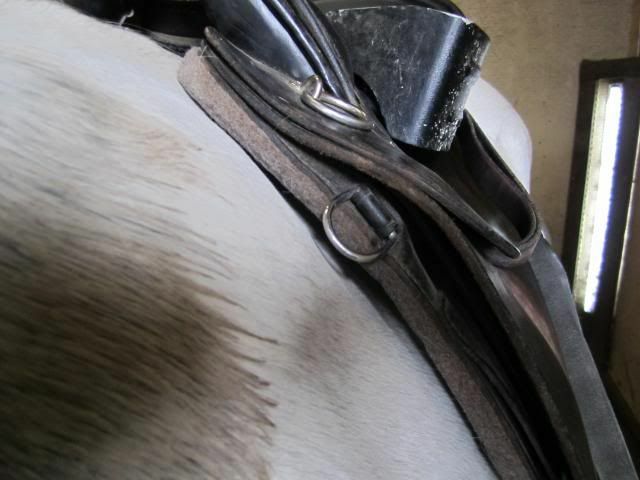 This looks like the saddle is bridging, touching the withers and loins with less pressure in the centre. 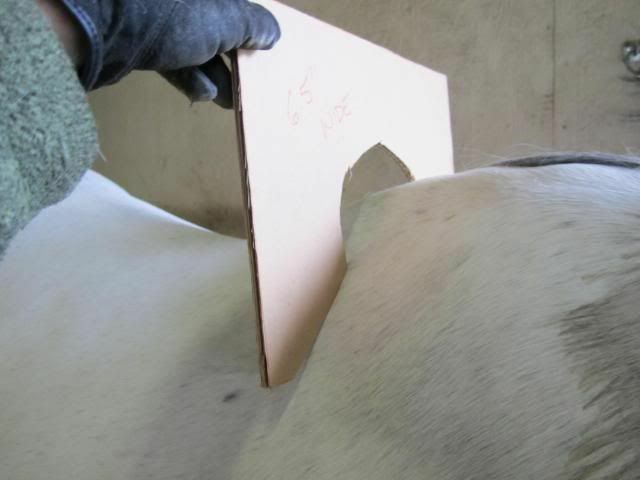 Probably a good idea to do the back to front template and see how it fits in the saddle to check. It looks to me like Pepper might be getting a little sway in her back, which often happens when horses reach their teens. That will cause bridging. There are pads designed for this, though I've not used them, and can't make any recommendations. I have this problem with Butterbaby, and am going to try to make some padding to fill in the dip, that I can attach to a regular pad. Just wondering; did you use this saddle for your wagon train ride, and how did it do? I'd think if there were any saddle fit problems, some soreness would have been apparent after several days of long rides! Actually I used my western saddle, so that I'd have the horn to hang bags off of. On the ride, Pepper lost some pounds, and there was no sign of dry spots or of any particular back soreness either. That one might just fit better; I should look at how the templates fit in it and see what the difference is.